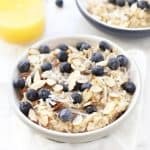 This delicious Blueberry Coconut Oatmeal recipe is made in the slow cooker with healthy ingredients like steel cut oats, coconut milk and blueberries. I love it because it is easy and healthy. Combine: Combine the Oatmeal Ingredients in a slow cooker. Cook: Cover and cook on low for 5-6 hours or on high for 2-3 hours. Stir every couple hours or so.